An outcome of this is The Initiative, a plan to train and monitor super heroes, and ultimately place super teams in each of the 50 states (for the most part Marvel had localized all their heroes in NYC). Avengers: The Initiative follows their training and the conflict that gradually starts to arise out of this situation. Cameos abound as both superheroes and villains find themselves having to register and undergo training. The trainees are largely an interesting group of unknowns. The training staff, however, includes characters well-known to fans such as Yellowjacket and Taskmaster. At this point in the series there have been some casualties, such as MVP, the most promising new trainee, who was killed in his first training session. There has been some intrigue, particularly in the way Gyrich manipulates the team for secretive government operations, i.e. covering up MVP's death, for one. Some of the heroes, like Yellowjacket, are using this as a second chance to shine and let go of the guilt associated with his past (domestic violence). Some of the villains, like Taskmaster, are using this as a way to bide their time, honing their powers while they await for the tide to turn back in their favor. In this latest issue, someone who may or may not be MVP, returns to kill all those present at his death, enacting revenge on all who participated in the cover-up. He has only gotten started, as this massacre looks to continue next month, and already it looks like a veteran character from the inception of Marvel Comics is one of the first casualties. Dan Slott and Chris Gage have created characters in which it is easy to invest emotionally despite the fact that they are quite new to this world. And they give new dimension to stalwarts such as Yellowjacket and Gyrich, who each have complicated motives for being a part of this effort. The art is phenomenal. Stefano Caselli has a clean line influenced in equal parts by Japanese Manga and the European Heavy Metal magazine. However, the real star is Daniele Rudoni, the colorist. Her color art picks up where Caselli's inking ends. It gives form, dimension and shading usually reserved for the inker in comics. Rudoni is one artist to keep your eye on. 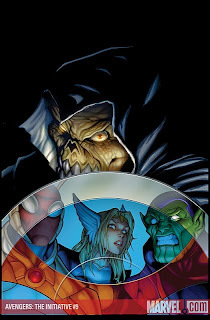 Next up for the team, survivors of this massacre will have to contend with their infiltration by the Skrulls in what is shaping up to be the next big comic crossover event this year, Secret Invasion .